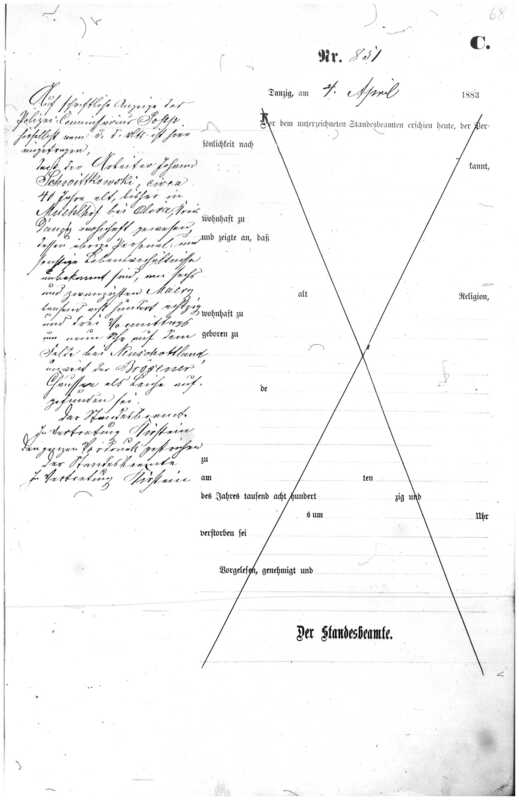 My 3rd Great Grandfather, Johann Schwittkowksi’s Death Certificate? Maybe. With the help of Luana Darby who went to the Family History Library in Utah to get this scan of Johann’s death certificate and the help of Carolina Meyer from my Genealogy Translations Facebook page, I now have a death register on Johann Schwittkowski. However, it leaves me with more questions and speculation. Is this is MY Johann? The area seems correct, but with no other names or relations on this register, it is hard to say. On written notice of April 3 by the police commissioner Posep from here it is registered that the laborer [Arbeiter] Johann Schwittkowski, about 40 years old, up until now residing in Muehlhof [Mühlhof] close to Oliva [Oliwa] county [Kreis] Danzig, whose personal and other living conditions are not known, was found dead on 26 March 1883 at 9 a.m. on the field close to Neu Schottland near the Brösener Alley [Brösener Chaussee]. If my research is correct, Mühlhof is now near where the Historic Water Forge near Oliwa. There was a railway line and a horse drawn tram connection. Neu Schottland (New Scotland) is now Szkoty, a former railway transport line which is now only used for freight. According to Wikipedia, it was opened in October 1867. On the map below I mapped a black line from around where he lived to where he was found in the field on this current day map. The distance of about 4 – 5 miles. The area would be the right place to find Johann, but because the record does not mention any other personal information, I cannot be certain that this is him. I’ve always shown 1883 death as a source because it was the only Johann Schwittkowski I found at the time. But, I now know, there could be others with the same name. More research is to be done. A gentleman from one of the FB sites wrote me while I was writing this, trying to help me with this record. He found address books where the Schwittkowski’s seemed to have lived. The names seem right; Johann, Anton, Elisabeth. I will now research those a little bit and see what I can find. It seems there were Schwittkowski names in that house until at least 1922! The street name in German is Holzmarkt, he lived in #19 for years according to the directories. The Polish, current name, is Targ Drzewny in Gdansk. Was he walking home? Was he taking the tram? I guess we will never know.